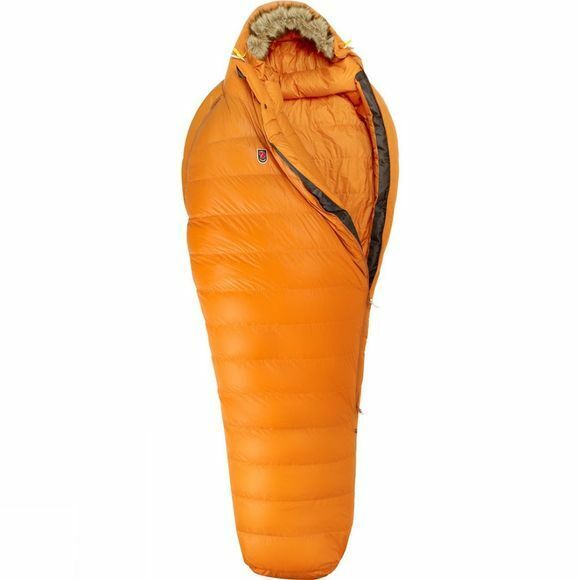 Well-insulated down sleeping bag with well thought-through-functions for winter trips in extreme cold. Padded with Fjällräven's highest-quality down, with excellent insulation and compressibility. The down is in box channels, reducing the risk of cold spots. The characteristic hood is inspired by Fjällräven's warmest jackets and has detachable synthetic fur edging that minimises heat loss. The hood's design allows it to follow the movements of the head which reduces the risk of moist air being breathed out into the bag. The hood's design also means there is less air volume that needs to be warmed up, which leads to better insulation. A full-length, two-way zip on the left side makes ventilating the bag easy. 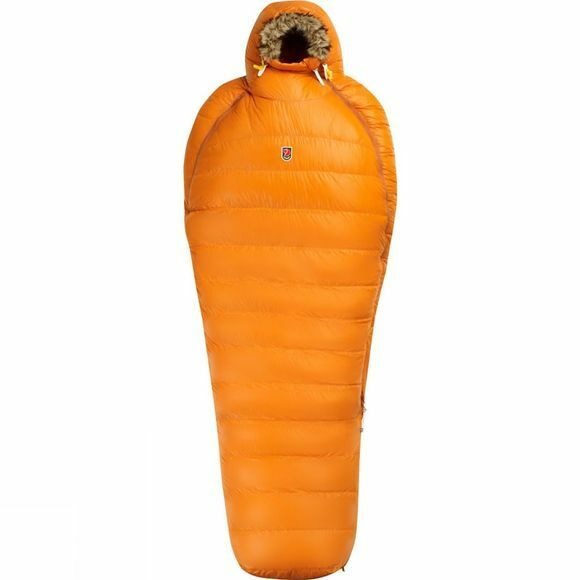 There is a shorter zip on the right side and this combination makes it possible to sit in the sleeping bag with the arms out, allowing you to organise your gear. The zip has a down-filled protective flap that keeps draughts out and can be closed with press buttons in case the zip should break, providing extra safety on long trips in cold conditions. Details in leather. Waterproof compression bag with roll-top closure. A large storage bag is also included and the sleeping bag has eyelets at the feet so it can be stored hanging.